Warm Welcome! 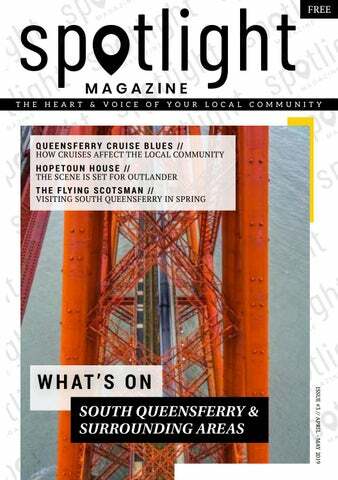 W elcome to the third edition of Spotlight Magazine, keeping you up to date on everything going on in and around South Queensferry. In this issue we will be looking at some of the sterling work that is being done locally and internationally by The Rotary Club of South Queensferry and CleanFerry. If you are the type of person who wants to help, then these charities are looking for volunteers of all ages. If you are a young person who wants to help then the Rotary Youth Leadership Awards could give you skills and experience that will look great on any application or CV. to read about how South Queensferry’s Hopetoun House now has an Outlander at Hopetoun House guide on its website, as the stately home has been featured in the show quite a few times, most notably for some dramatic swordfights. Last year Edinburgh was voted Top Cruise Destination, and with cruise ships anchoring at South Queensferry, we look at the impact it has had on the town from traffic congestion to the positive impact of local volunteer group CruiseForth, who welcome passengers and let them know what is going on in the area. We hope you enjoy this edition of Spotlight, which takes us into spring and with a bit of luck some warmer weather. Gerald Smith Rotary Club of South Queensferry https://www.rotary-ribi.org/clubs/homepage.php?ClubID=112 Community Noticeboard A huge thank you to everyone who has contributed to the Community Noticeboard! Does South Queensferry have cruise blues or is it plain sailing? L ast June, when Edinburgh was named ‘Western Europe’s Top Cruise Destination 2018’ in the Cruise Critic’s awards, the city beat the likes of Lisbon and Bilbao, proved that sun is not a holiday essential and gave the East Coast another clear sign that it could more than hold its own against major international players in the increasingly competitive world of destination cruising. the largest ship ever to visit the Forth and stayed for 12-hours, allowing for excursions to Edinburgh and around local sights as well. But as cruise season 2019 gets set to launch this May and South Queensferry gears up for the arrival of 22 ships and thousands of passengers between May and September, what impact is the developing cruise industry really having on the area around what is now one of Edinburgh’s most valuable deep-water anchorages. to spend time, and money, visiting other sights and not just Edinburgh. 22 to 57. Companies are now confidently scheduling larger ships for Scottish cruises and overnight anchorage is becoming increasingly popular. All good news for local businesses which, while not celebrating a boom, do acknowledge an uptick in trade when cruises come to town. However, despite larger ships and greater numbers of cruise passengers now descending on South Queensferry, the town’s infrastructure has never been adapted to cope. A problem that’s particularly noticeable at Hawes Pier car park which was closed to all vehicles, apart from cruise-linked coaches, for a total of 25 days in 2018. Last September, Liberal Democrat MSP Alex Cole Hamilton raised this issue with the city council, pointing out that Edinburgh receives almost £300,000 per annum in cruise revenue, some of which should be allocated to improve traffic management at South Queensferry. The matter is currently under review and possible improvements are being considered in line with work currently underway on Queensferry High Street. A certain amount of credit for this change in attitude goes to the team of CruiseForth volunteers who now meet and greet every cruise ship arriving at South Queensferry, provide valuable visitor information and capitalise on the fact that not all cruise passengers have pre-booked onshore excursions and many are looking for inspiration on what to see and do locally instead. A regional finalist in the 2018/2019 Scottish Thistle Awards, CruiseForth were also praised by Rob Mason of Capital Cruising when he commented on Edinburgh being named ‘Western Europe’s Top Cruise Destination 2018’, saying, ‘My thanks to our hard working cruise team and to the 50 volunteers from CruiseForth who work tirelessly all season warmly welcoming thousands of passengers to Edinburgh.’ So, while new and improved traffic management may not be in place in for the arrival of the first ship of 2019 on 10 May, it seems as if the positive aspects of the cruise industry on South Queensferry continue to outweigh the negative. There is no time like the present to get your boiler serviced and checked that it’s safe and in working order. Release the potential leader within What are the Rotary Youth Leadership Awards? confident enough to speak out and knowing what to say, knowing when to listen to others and understand. RYLA teaches this, and other soft skills, to help everyone to be the best they can be. Rotary Youth Leadership Awards, or RYLA, is a leadership development programme run by Rotary for young adults. Teamwork exercises bring people together from different walks of life in a safe environment where everyone can get to know each other without fear of exclusion or negativity. Whether you are a secondary school pupil, university student or young professional, RYLA will help you discover your potential and develop the skills needed to be a leader in your community, career and everyday life. Each RYLA course is sponsored by a local Rotary club or group. As with all Rotary programmes, Rotary members are appropriately DBS checked and risk assessments are carried out for all activities. You don’t need to be a high achiever with outstanding academic grades, just be willing to try something new through activity-based learning and discover new talents along the way, as well as having fun. Dransfield were given the opportunity to experience the adventure for themselves upon their return the students give a small presentation to the Club about their activities. The 2017 Team Fiona Stoddart, Ssarien Liddell, Kathryn Hope, Cameron McArther, and the Ryla Co-Ordinator James Gibbons. Catriona McRoberts and Erin Boyes enjoyed the 2016 Camp. All types of plumbing and Central Heating work carried out with FREE estimates. (0131) 335 0146 or 07831 230 319 for personal attention. visits to Argyll, and from round about South Queensferry, where she now lives and works. Ferry Brewery’s winning combo of award-winning beer, good food and fine tunes is back on Saturday 30 March, launching the third season of Ferry Brewery Nights. Expect favourite brews on tap and keg, along with new beers, music by Graeme Pearson and deliciousness from Down The Hatch Café. Tickets £5, including first drink. Looking for something to do with kids on Easter Sunday? Easter at the Castle opens the summer season at Lauriston Castle on 21 April, and families can look forward to a morning of arts and crafts, walking trails, games and competitions, plus plenty of chocolate, of course. Tickets cost £7 and the fun starts at 10am. Hopetoun House and Grounds reopen for summer on 19 April between 10.30am and 5pm. April 21	Family Easter Fun at Hopetoun No need to book for Family Easter Fun at Hopetoun on 21 April, just turn up any time between 12 and 4pm, bring lots of energy and dive right in. Highlights include an Easter craft workshop and a treat-rich Easter treasure trail. Adult tickets, £4.75; child tickets, £2.75. April 28	Charity Tango Tea Head to Dalmeny Halls on Sunday 28 April and take a tango lessons with Willie and Louise Green, or just sit back, enjoy Afternoon Tea and watch the experts make it look easy. This is a fundraising event for Queensferry Care and tickets cost £10, including afternoon tea and a dance class. awareness of the global ‘poverty divide’, in three decades they’ve also raised more than £1.4 million in donations. So if you feel like crossing the Forth Bridge in May, think about doing it for a good cause. May 10	Crown Princess anchoring at South Queensferry Carrying 3000 passengers and sailing from Southampton, Princess Cruises’ Crown Princess is the first ship to anchor at South Queensferry in 2019. Take a look at Visit Queensferry For more events and information on what’s happening in South Queensferry, Kirkliston and Dalmeny during April and May 2019. If Ifthe theanswer answeris is YES, YES,this thisOFFER OFFERis isforforyou! you! AreAre youyou aware aware thatthat in order in order to keep to keep your your boiler boiler andand unvented unvented water water cylinder cylinder guarantee guarantee valid, valid, youyou MUST MUST have have your your appliances appliances services services annually annually andand your your service service details details logged logged in in your your boiler boiler andand hothot water water manuals manuals by an by accredited an accredited GasGas SafeSafe engineer? engineer? As an As accredited an accredited GasGas SafeSafe engineer engineer with with overover 30 years' 30 years' experience, experience, I amI am ableable to carry to carry outout thisthis work work for for youyou andand offer offer a FREE a FREE unvented unvented water water cylinder cylinder check check with with every every boiler boiler service. service. Please Please callcall / e-mail / e-mail to book to book your your appointment appointment or for or for further further information. information. Freedom from Fistula Around 2 million girls and women across Africa suffer from obstetric fistula caused by prolonged, obstructed childbirth combined with a lack of access to maternity care. This can result in women developing urinary incontinence, which can lead to them being ostracised from their families and communities due to issues with smell and wetness. The sad thing is that obstetric fistula has been eradicated in the developed world, so women in Africa should not have to live with this issue. The Rotary Club of South Queensferry have been supporting the FFF Foundation for the past ten years, to help fund treatment of this condition. There are now treatment centres in Kenya, Madagascar, Malawi and Sierra Leone, so that women no longer have to suffer in silence. Kirkliston Community Centre has some fantastic resources and clubs for the younger people in the village. Whether the kids want to keep fit, learn new sports, hang out with friends at the youth cafe or learn a new instrument with pals, we have a lot going on to keep them occupied. For more information on the classes below, you can visit the website at www.kirklistoncommunitycentre.org or give the centre and call and we’ll tell you more about the clubs. Our caring, experienced and dedicated veterinary team is committed to providing the best possible care for your pet in the Edinburgh, Lothian and Central regions. Our practice is modern, well- equipped and progressive, with a strong emphasis on preventative healthcare and advice. ove it, loathe it or couldn’t care less about it, time-travelling drama, Outlander, looks set to be around for the foreseeable future. Season 4 of the TV show aired its final episode on 27 January 2019, Season 5 is currently in production with a release date later this year, and STARZ has already commissioned a sixth season due to air in early 2020. Should you find yourself suffering Outlander cravings in the tiny time window when the show isn’t on (known to super-fans as Droughtlander), there’s no shortage of ways to get a fix: from an Outlander Airbnb in Dean Village to Outlander Edinburgh walking tours, Outlander Jacobean jewellery and even an Outlander crowdfunding campaign, launched by the National Trust in February to save East Linton’s Preston Mill - a location the keen-eyed may remember from season 1, way back in 2014.
in 1991. Apparently, her original idea for Outlander was sparked by an episode of Doctor Who set in 18th century Scotland. If that seems far-fetched, it’s something Ms Gabaldon could have confirmed, or otherwise, when she was ‘In Conversation’ at Hopetoun House on Friday 15 March this year. Although, to hear what she had to say on the subject of inspiration meant having a ticket to the event, and those sold out as soon as they were released on 1 March 2019: think of it as the ‘Outlander Effect’, a phenomenon to which very little is immune it seems. resh from a £4.2 million restoration, the Flying Scotsman is heading north this spring and anyone with eyes on the Forth Bridge can look forward to seeing the world’s most famous locomotive crossing Scotland’s most iconic bridge on one of three Fife Circle tours organised by the Scottish Railway Preservation Society (SRPS) for Sunday 19 May. South Queensferry clearly has the train spotting advantage here, but if a glimpse of history isn’t enough, tickets are now on sale for all three scheduled Fife Circle tours. The morning tour departs Linlithgow at 8.50am and returns at 12.40pm; the afternoon tour leaves from Dalmeny at 1.45pm, returning at 6.50pm, and the evening train sets off from Inverkeithing at 7pm and arrives back at 10.30pm. Each tour lasts approximately three and a half hours and travels the coastal route from Dunfermline through Culross and Kincardine, takes in Clackmannan and Alloa, before heading for Stirling and onwards to Falkirk to complete the Fife Circle. On-route, passengers can look forward to stunning views of the Firth of Forth, Edinburgh and Lothians, the Ochil Hills and the Wallace Monument. True to the Flying Scotsman’s vintage style, you can have breakfast, lunch or dinner on-board, served at your table by an SRPS volunteer steward. And there’s also a Buffet Car open for snacks and drinks during all three Fife Circle tours. What’s so special about the Flying Scotsman? or go full-immersion and take a Fife Circle tour, it’s hard not to be impressed by the locomotive’s powerful heritage. Built in Doncaster in 1923 for London and North Eastern Railway (LNER), it was the first locomotive to haul a passenger train from Edinburgh to London in just eight hours. In 1934 it broke UK records by clocking a speed of 100mph on a special test run. And, although a career with British Railways officially ended in 1963, the Flying Scotsman continued to work in private ownership: touring the US and Australia, and even hauling the legendary Orient Express on several occasions. In 2004, the National Railway Museum launched a campaign to save the historic locomotive for the nation. Thanks to public generosity and substantial grants from both the Heritage Lottery Fund and the National Heritage Memorial Fund, the slow process of returning the Flying Scotsman to its former glory began in 2006. The entire restoration process might have taken over a decade to complete at a cost of £4.2 million, but the distinctive green locomotive now more than earns its keep; first as a remarkable working museum and then by touring throughout the UK each year to give a whole new generation the opportunity to experience a more leisurely era of rail travel, for a journey’s length at least. Tickets for Fife Circle tours aboard the Flying Scotsman on Sunday 19 May 2019 are available to book online from the Scottish Railway Preservation Society (SRPS). Fares cost from £99 for adults and £75 for children aged 14 or under. The new Kirkliston Community Centre Craft Club is perfect for anyone who’s wanting to try something new, whether you are skilled, just enthusiastic or an absolute beginner. Meet new people, create something amazing and pick up a handy new skill and we always have time for cuppa. Our ‘To Do’ List is growing every week so many new Crafts to learn and we have a super group of ladies who are there to share their skills with everyone who comes along. REST ASSURED POCKET 800 DOUBLE MATTRESS WITH LUXURY BASE.